This Thursday, February 18th, is “National Drink Wine Day”. The day is celebrated in effort to spread the love and health benefits of wine. Wine has held an important role throughout history in relationships and religion. We embrace the positive benefits of wine such as new friends, reduced risk of heart disease and the enhancement of food and life. 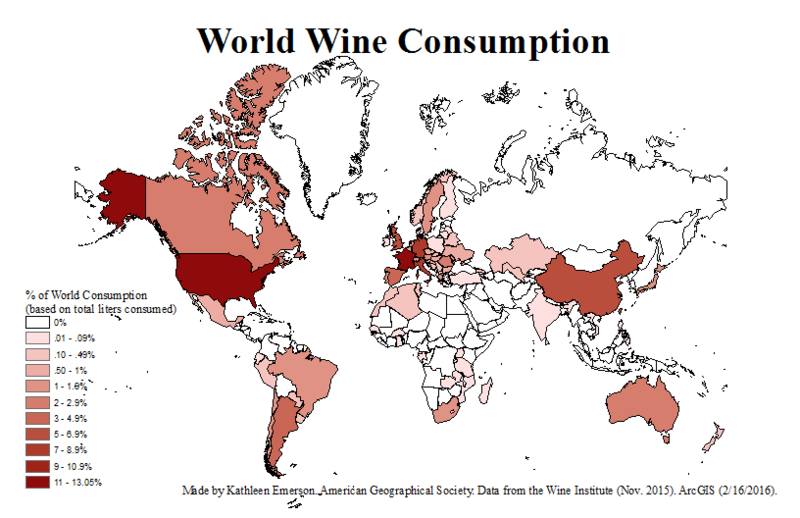 In honor of “National Drink Wine Day” this Thursday, February 18th, check out this map that shows the consumption percentages of wine worldwide and see how different countries measure next to each other. Red wine makes people happy. Red wine has anti-age reducing properties. Red wine can reduce the risk of dementia. Wine can reduce ovarian and breast cancer cells. Wine can decrease your cholesterol levels. Wine reduces the risk of coronary heart disease. As our map shows, the United States consumes 13.03 percent of the worlds produced wine, while France follows behind with 11.29 percent. How much wine does your country consume? If you are interested in reading more about wine, click here to read this blog by Jen Miller.